Fin Comb for straightening fins of a condenser coil. Sold in pairs. 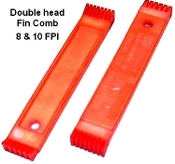 The double head comb has 8 or 10 fins per inch size teeth. Use by inserting the teeth in the fins and pull firmly bottom up or top down. Excercise care not to not bend the fins. It will be very difficult to unfold bent fins. Damage fins reduce radiation of heat to cool the freon gas. We sell only the Best slush machine.